Custom lure painting can increase the success of an angler. For some, it can turned into a career. Custom painted lures give competitive anglers an edge, and they will pay a premium price for effective lures. Painting your own lures requires practice and an eye for detail. Numerous lure design options require you to know the feeding habits and bait fish available in the waters you plan to fish. Painting lures requires only a few basic tools, but practice makes it possible to achieve perfect replicas of actual bait fish. 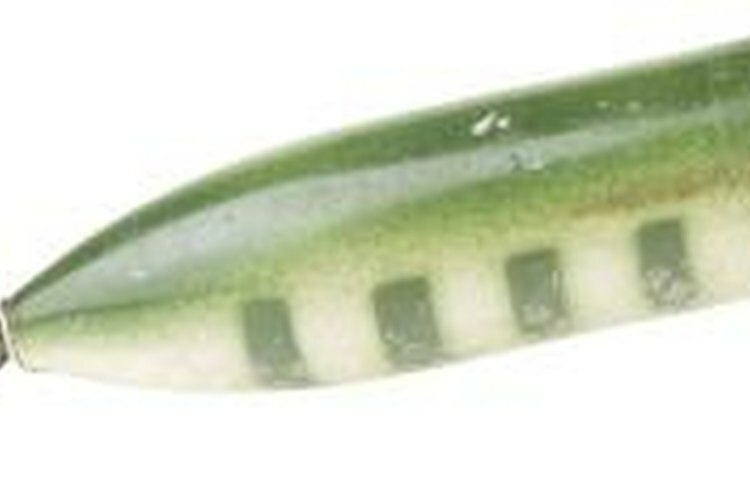 Begin with simple lure designs, using two colors, before attempting intricate designs. Screw the wall hook into the head of the lure. Do not screw it in as far as possible, but far enough to prevent it from falling out. The hook will allow you to hold the lure and hang it to dry. Dip the lure in the white enamel and let dry. Do this three times to build a thick base of enamel before painting the lure. Place the wall hook in the vise grip and tighten the jaws until the lure is secure. Wrap masking tape around the lure to block out areas where the white enamel will remain in the original form. Apply a coat of red paint to the exposed areas of the lure and let it dry for 3 hours. Remove the masking tape to expose the white. If you want to add another color, use the masking tape to preserve the colors that already exist on the lure and paint the newly exposed area. Use the paintbrush to add eyes to the head of the lure. Let the lure dry. You can vary the combination of colors. Effective combos include red and white, yellow and white, orange and black, and black and purple. You should choose colors to match the bait fish in the waters where you will use the lure.